My first job as a substitute teacher was with a fourth grade class that had just begun reading Number the Stars. Their teacher learned I had visited the Holocaust Museum in Washington, D.C., and asked if I would be interested in presenting what I had learned. I was…but when I had gone to the museum, I had been unable to go inside to the main exhibits. I only saw the atrium displays, which were mostly words and photographs printed on hard plastic, so I didn’t have any pictures. The Dauchau grounds. Photo by G. Brown. 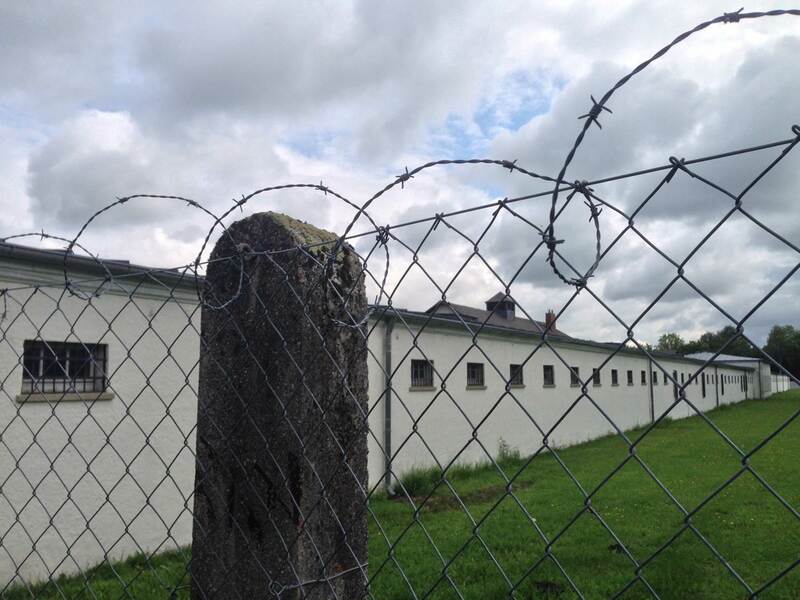 However, my younger brother had visited Dachau, the first concentration camp built, when he took a study abroad trip last summer. He sent me pictures from the camp in Germany. I sorted through them. This would be the first time these students heard an in-depth presentation about the Holocaust in school, and I wanted to make sure I talked about the events gently without shrinking. The day of my talk, I directed the students to move their desks to the side of the room and bring their chairs toward the screen. They did so, and some of them were so eager to see what I was going to present that I had to ask them to scoot back so I had room to stand. I went down the row, answering their questions. Those with dark hair gasped and groaned and moved their chairs to the back of the room so they could sit on the floor. The next slide showed the population of Indiana: 6,483,402, slightly larger than the 6 million number given for Jews who were killed in the Holocaust. “And here is the total number of people who died.” 11 million: the state of Ohio practically gone. Fence around Dauchau. Photo by G. Brown. Then, I talked about Dauchau, sticking with the basics: what it was, who was sent there and when it opened. I showed pictures of fences and the barracks and beds. Pictures of the toilets lined up without any doors intrigued several of the boys. The hallway of prison cells and a thick door with a wooden square that moved aside to pass food through led some to examine the mechanics of the food doors. The next couple of slides introduced them to the concept of Auschwitz. I showed black-and-white photographs of the railroad tracks, “Arbeit Macht Frei” (“Work makes you free”) and people crammed into the beds. Finally, I introduced books. As the Holocaust was a topic that fascinated me as I was growing up (and still fascinates me as I constantly ask, “Why do people do what they do?”), I had read many stories of children taken to the camps, Gentiles who hid the Jews and more. I introduced the students to Anne Frank: The Diary of a Young Girl (later that day, one of the girls in the class asked me if she could go to the library as she was going to look for Anne Frank’s diary to read), Milkweed, The Girl Who Survived and The Book Thief, one I had recently enjoyed (there is a movie out now). I brought everything back around to Number the Stars, which we would tackle shortly after the presentation. And then it was time to let the dark-haired students speak again. A Dauchau gas chamber, one of the pictures I did not show. Photo by G. Brown. I gave them permission to vocalize their feelings as long as they raised their hands, and they all let out audible sighs. I asked them how they felt and what they thought. I fumbled for an answer. Instead, I asked him to repeat what he said so everyone could hear. Words finally returned and I said something that I hoped would drive the point home. Then, I told the seated students they could do something now: offer their classmates a chair and make sure everyone had one. The blond students scampered eagerly to the back of the room to grab a chair for their dark-haired comrades. A chorus of, “Here you go,” “Here’s a chair,” and “Sit here,” rang beautifully throughout the room. The teacher also said that Eva Kor would be at today’s 70th anniversary of the liberation of Auschwitz. Eva Mozes Kor and her sister, Miriam, were ten years old when Auschwitz was liberated and can be seen standing together in striped coats in the front row. Click on picture for source. That brought back memories. Eva Kor was a twin who endured the experiments of Josef Mengele when she was ten years old, the same age as many of the fourth grade students I taught that day. She and her sister survived Auschwitz and were liberated by the Soviet Army at the camp’s liberation on January 27, 1945. They were in the front row when the children left the camp. After living in refugee camps for the next nine months, the twins eventually made it to Romania to live with their aunt. Then, they immigrated to Israel, where Eva attended an agricultural school and joined the Israeli Army Engineering Corps, eventually becoming a Sergeant Major. There, she met her husband and was married in 1960. They then moved to Terre Haute, Indiana. Eva’s sister stayed in Israel. In 1984, Eva founded CANDLES, Children of Auschwitz Nazi Deadly Lab Experiments Survivors. The organization brought to light Mengele’s experiments and helped to find and reunite twins. In 1995, the organization built a museum in Terre Haute, which housed several artifacts related to Mengele. The museum was burned down my sophomore year of high school in a hate crime. They rebuilt the museum. Sometime prior to the destruction of the museum, Eva spoke during an assembly in my high school’s gymnasium. With a script in front of her, she described the horrifying events of the Holocaust and all she had gone through. Because it was over 12 years ago, I cannot remember a lot of the speech. What I do remember is that Eva could not use certain soaps because she had found out that the soap she used at Auschwitz was made from human remains. She spoke so matter-of-factly, and I wondered how her voice did not break with it all. She had given hundreds of presentations, and I guessed she read from the script each time, so that helped. But still…all those memories, rehashed, over and over again…. And yet, forty years after the Auschwitz liberation, she had stood at the site and forgiven the Nazis. Not everyone approved of the act, but Eva emphasized she forgave the Nazis for herself. Eva Kor. Click on photo for source. 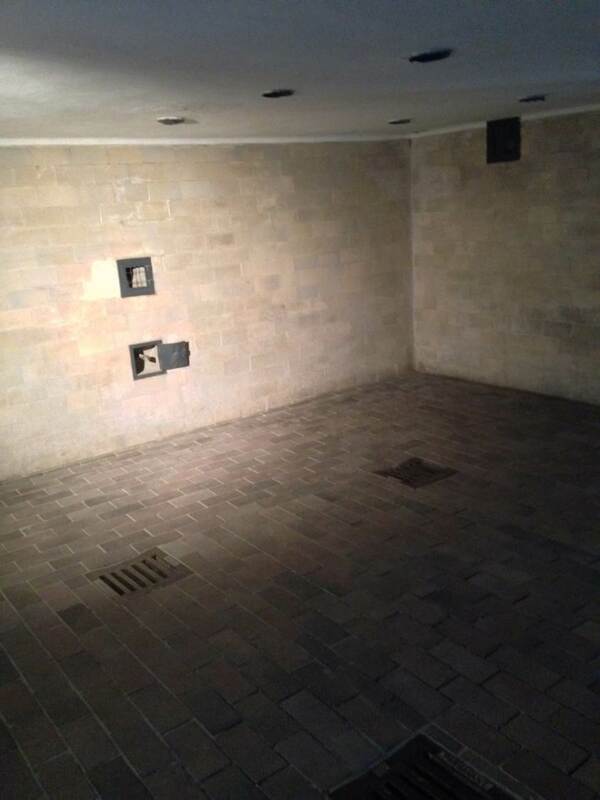 The pictures I had sorted out that didn’t make it into the presentation for the fourth graders were of gas chambers, brick ovens, sinks that prisoners hung themselves from, memorials. They were just two-dimensional images to me. But to Eva Kor, images like these were real. Memories that would not go away. Soap she couldn’t use. Health problems caused by experimentation. Railroad tracks that marked the last time she saw her family. And yet, she keeps going back to Auschwitz to help others understand what happened there and the nature of forgiveness. As I drove home, I thought about the 70th anniversary and the lesson I had given to the fourth graders. I smiled sadly thinking about that young boy’s answer to my question: How did you feel? Eva Kor talks about her journey to forgive the Nazis and help educators develop curriculum for Holocaust education in public schools by traveling back to Auschwitz. A presentation given in Columbus, Ohio, this past September, with the same or similar script that I heard over 12 years ago. Thank you for sharing this. I saw the movie, Unbroken, yesterday without realizing it was the anniversary of the liberation of Auschwitz. So hard to watch, but valuable for understanding. I, too, have been to Dachau and am haunted by what evil can be done by man to man. I hope to go to Auschwitz someday. While watching Unbroken, I somehow was fine through all the torture scenes, but when he came home, I started sobbing and found it hard to stop. There was such relief. What a good movie.